Help to save the lives of others by registering to be an organ, tissue, and eye donor. You may enroll on Florida’s organ and tissue donor registry when you apply for or renew your driver license or ID card at your local driver license office or tax collector’s office. You can also register online at RegisterMe.org. 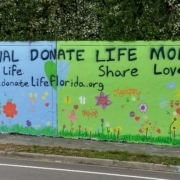 If you are unable to enroll online or via the driver license or tax collector’s office, you can contact Donate Life Florida, and they will mail a registration form to you. http://www.alachuacollector.com/wp-content/uploads/2019/04/56411000_2432706563429800_3820946723501506560_o.jpg 1326 3159 Jessica Phillips http://www.alachuacollector.com/wp-content/uploads/2013/04/tiny-header-logo.png Jessica Phillips2019-04-12 09:41:192019-04-12 09:43:07April is National Donate Life Month! 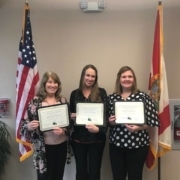 Congratulations to our 2019 Management Academy Graduates, Melissa, Colette and Regina! This program offered through the Alachua County Office of Organizational Development and Training has prepared them for the management, supervision & development of employees. Great job ladies! Thank you for your commitment to the program. http://www.alachuacollector.com/wp-content/uploads/2019/04/56870003_2445335428833580_6472404058807205888_n.jpg 640 480 Jessica Phillips http://www.alachuacollector.com/wp-content/uploads/2013/04/tiny-header-logo.png Jessica Phillips2019-04-12 09:23:412019-04-12 09:26:54Congratulations to our 2019 Management Academy Graduates! 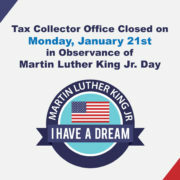 Our office is closed on Monday, January 21st in observance of Martin Luther King Jr. Day. 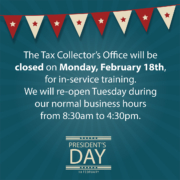 We will resume our normal business hours the following day. Take advantage of our website to renew your auto registration, pay your property taxes, make an appointment, or find information about our various services. The University of Florida license plate is the best-selling specialty tag in the state of Florida. 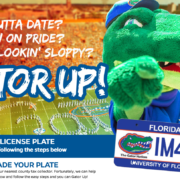 An estimated 96,000 plates are purchased/renewed each year generating millions for scholarships and to strengthen the value of a UF degree! Click Here to make an appointment to purchase your plate. http://www.alachuacollector.com/wp-content/uploads/2019/01/Screenshot-2019-01-16-09.25.35.png 811 1363 Jessica Phillips http://www.alachuacollector.com/wp-content/uploads/2013/04/tiny-header-logo.png Jessica Phillips2019-01-16 09:35:592019-01-16 09:36:27Gator Up! UF Plates Available at our Office! 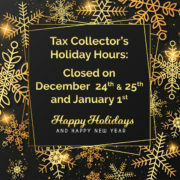 All of our offices will be closed on December 24th and 25th, and January 1st. Our website is available 24 hours a day. Please consider taking advantage of our convenient online services by renewing your auto registration or paying your property taxes online at www.AlachuaCollector.com.